Critically acclaimed visual novel set for western console release. 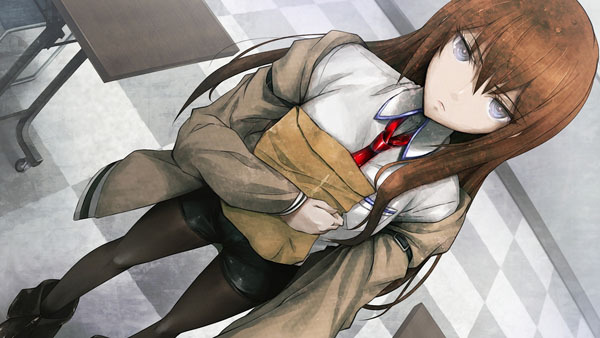 PQube is bringing Steins;Gate to PlayStation 3 and PS Vita in North America and Europe in 2015, the publisher announced. The critically acclaimed visual novel game comes from Mages and 5pb’s Science Adventure Team. It follows a band of students who discover how to send text messages to the past. But their experiments soon spiral out of control. Find a full summary below, via PQube. Steins;Gate is the award-winning time travel science-fiction interactive visual novel developed by 5pb. and Nitroplus. STEINS;GATE was awarded Famitsu magazine’s coveted annual Game of Excellence award, and was voted one of the most emotionally charged “tear-inducing games” ever made, in a Famitsu poll. It is widely considered to be the finest Visual Novel ever made. Steins;Gate follows a rag-tag band of tech-savvy young students who discover the means of changing the past via text message, using a modified microwave. Their experiments into how far they can go with their discovery begin to spiral out of control as they become entangled in a conspiracy surrounding SERN, the organization behind the Large Hadron Collider, and John Titor – a mysterious forum poster who claims to be from a dystopian future. Interaction with the game takes place through the “phone trigger” system, where the player can receive calls and text messages and decide whether to reply to them or not, changing the outcome of the game’s plot.